Known as the symbol of light and freedom and perched on top of fifteen luxury stretch Hummer limousines, the menorah was on display in the finest fashion as over 220 teens descended on Manhattan last week to celebrate the victory of the few over the many. On the fourth night of Chanukah, fifteen teen directors from across the tri-state area came together with their teens to experience the holiday in style. 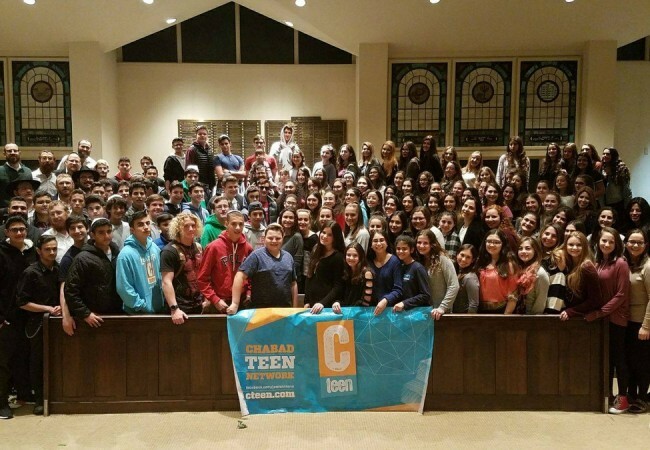 From Livingston NJ, to Suffern NY, the teens are part of a national teen network known as Cteen – The Chabad Teen Network. The excitement quickly built as the limousines – which were arranged by Rabbi Levi Wolosow and Rabbi Michoel Goldin – pulled up one by one to the designated meeting place near Battery Park, where the teens received chocolate Chanukah “gelt”. After the group photo, the teens and their rabbis hopped back into their limousines and started the grand parade up the West Side Highway to Chabad of Midtown. Screams of “Happy Chanukah” and “light your menorah” could be heard coming from these normally secretive and disguised vehicles, as the teens utilized the moment to try to warm the hearts of everyone they passed. Arriving at the Chabad House, the teens got to know each other a little better through a quick icebreaker. Chanukah food favorites such as doughnuts and latkes–and in true New York style, fifty pies of pizza–were served, as Rabbi Michoel Goldin entertained the crowd. Live music then energized an already upbeat crowd as all took to the dance floor for an hour of song and dance. And as a Chanukah party can’t be complete without a dreidel spin, the biggest dreidel tournament in Manhattan was about to take off. Rabbi Meir Geisinsky chaired the contest, with dreidels of all colors and sizes being spun as teens split into groups vying for the pot of over 200 dollars. With the evening coming to a close, the shluchim who had come together in a show of unity all remarked how beautiful and successful the evening was. As the teens entered their limousines for the ride home, many noticed the still intact ice menorah on 5th avenue, showing them that the light of the menorah far outlasts any darkness. Cteen would like to give special thanks to Rabbi Michoel Goldin for all the effort he put into making this event the success that it was. Cteen would also like to give thanks to Rabbi Meir Geisinsky, Rabbi Levi Wolosow and all the teen directors: Rabbi Avremel Blesovsky, Rabbi Dov Drizin, Rabbi Shmuli Gancz, Rabbi Levi Grossbaum, Rabbi Michoel Gurkov, Rabbi Meir Konikov, Rabbi Mendy Lewis, Rabbi Yitzchok Moully, Rabbi Mendy Korer, Rabbi Yacov Kornitzer, Rabbi Dovid Okonov, Rabbi Shmaya Krinsky and Mrs. Sara Hecht. Next Post: 600 children involved. Have you joined yet? 161 CTeen Chapters Celebrates Shabbat, TGIS Style!